Are you always looking for ways to make your garden interesting? Are you a little bored just coordinating colors and textures to make it visually appealing? Time to take your garden to a new level. Add aroma-filled “perfume” plants into the mix and you’ll soon find your family spending a lot more time outdoors. Gardens are not only soothing to the eye, they can be a delight to your sense of smell as well. 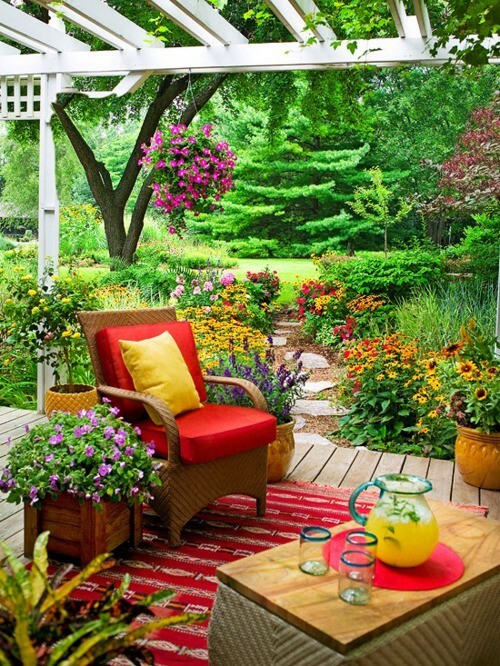 Start by designing your landscape with aroma in mind. Notice the places that could use a little “scent” pick-me-up. Plant scented herbs like Thyme and Mint between pavers to give you a burst of aroma when you step on them. Planning is the key to successfully distributing “perfume” plants throughout your garden. Avoid creating a flower bed in one area for all your new scented plants because they will overpower each other. You will wind up with something akin to the perfume counter at Macy’s with all of the plants competing for your attention. Determine the fragrance level (strong to subtle) and the times the plants are the most aromatic (day or night) before planting them. Your goal is to have a scented garden from spring to fall and during both daylight and evening hours. Once you’ve selected where you want the plants, determine which “perfume” plants you want. Even though a particular plant is most fragrant at night it may need plenty of sun during the day to prosper, so placement is important. Consider using a mix of flowering plants, shrubs, herbs and trees to enhance the perfume of your garden. Select some of the new hybrid “perfume” plants that are available at your local nursery. Maybe what your garden needs is a little “Pink Zazzle” Gomphrena (Globe Amaranth), “Vermillionaire” Cuphea or “Bounce” Impatiens, which bring some heavenly fragrance to your abode. These hybrids are typically easy to grow and hardy until the first frost. When it’s time to plant your scent makers, break up the soil and add organic matter or compost to help enrich it. Remember to stagger them throughout the area to create the most enjoyment. Add a generous covering of mulch to help the new plants retain moisture and get them off to a good start. Scientists say that the sense of smell is one of our most powerful senses. Humans associate memories and emotions with particular fragrances. Just a whiff of a particular aroma can send your mouth watering or your heart soaring. So next time you take a moonlight stroll in the garden, take a deep breath and remember what you’re feeling at that moment. There’s a safe bet that when you encounter that fragrance again, you’ll think back to that nighttime walk. Maybe that’s why they tell you to stop and smell the roses. Our expert staff is always on hand to help you with your garden projects. From small tillers and wheel barrows to shovels and mulch, if you have any questions about what to choose, pricing or how-to’s, don’t hesitate to contact us. Stop by our store — we’re open seven days a week.